Home >> Lactation Center >> Melissa Tackett, R.N. Missy is a native of WV who achieved her nursing degree in 1998 at Bluefield State College. She has 12 years experience as a Labor, Delivery, and Postpartum nurse where she cared for many breastfeeding mothers and infants. She has been an International Board Certified Lactation Consultant (IBCLC) since 2005. She received her training for this credentialing at Miami Valley Hospital in Dayton, OH. She was credentialed through the IBLCE, or the International Board of Lactation Consultant Examiners, which is the independent international certification body confirming the mCLC status. Missy is also a member of the International Lactation Consultant Association (ILCA) which is the professional association for IBCLCs and other healthcare professionals who care for breastfeeding families. 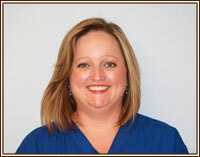 Missy joined South Charleston Pediatrics as a Lactation Consultant in 2009. She is happily married and has 2 beautiful children. She is an avid reader, loves to garden, and enjoys spending time outdoors with her family.